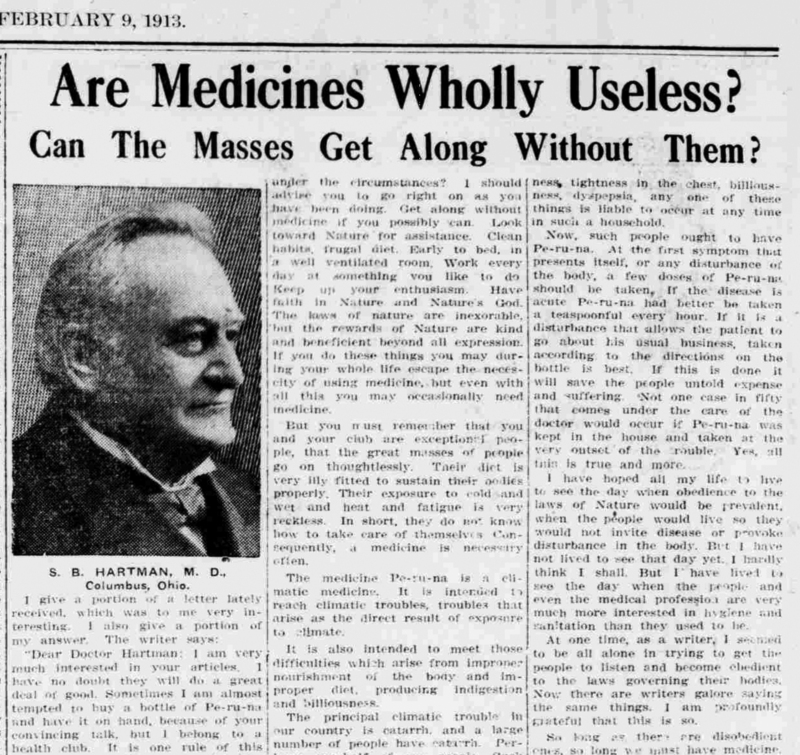 History Adventuring: Caring for your health in old-time Phoenix - take your medicine! 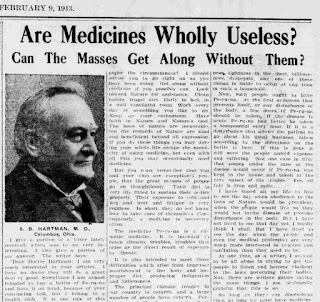 Caring for your health in old-time Phoenix - take your medicine! As someone who enjoys researching information about the old photos of Phoenix I collect, I spend a lot of time looking at old newspapers. And then, as now, there's a lot of ads. And many of them deal with the kind of stuff we deal with now, such as caring for your health. Of course, from the vantage point of the 21st Century, most of them look absolutely ridiculous. The ad at the top of this post, for Per-ru-na, is typical of a "patent medicine". And patent medicines were wildly popular at the time. People wanted to believe that something in a bottle would cure everything. I understand. As someone who suffers from chronic pain, I know the benefits of belief. If I lived in old-time Phoenix, I would probably have my trusty bottle of Per-ru-na handy, and I'm sure that friends would buy me some bottles, too. And long after it was proven to be nothing more than alcohol, flavoring, and coloring (which most patent medicines were), I would stick to it, and take it. That's the power of the mind, and the power of belief. Sometimes hope can be a wonderful thing. Of course, 100 years from now whatever we consider "state of the art" will seem primitive to future generations. That's just the way it works. It's possible that NyQuil will be linked with insanity (I'd say I make a good case for that today!). I don't know. Of course the best way to care for your health is to exercise and have a healthy diet. People in old-time Phoenix got a lot more exercise than people get nowadays (even the ones who drive to the gym), but whether their food was anything I'd eat is hard to say. I'm used to my food and water being clean and fresh, and chances are slim in Phoenix in 1913 there was a lot of that around. Yes, they did their best, but you gotta admit that things are better now. When the nice people at Sparkletts deliver my water I never give a thought that there might be something swimming around in it, from a questionable well in my backyard. It's time like this that I like the idea of visiting old-time Phoenix in my mind, but then returning to the modern world.